As a dysfunctional Washington stumbled past the midnight deadline and into a shutdown of the federal government, state officials scrambled to prepare for its impacts across Florida. Many aspects of life involve the federal government, from Everglades National Park in Homestead to MacDill Air Force Base in Tampa, and in a state full of retirees, a lifeline is a monthly Social Security check — which officials emphasize won't be disrupted by a shutdown. The U.S. Central Command would be mostly unaffected because of its war-fighting mission, said CentCom spokesman Col. John Thomas. "Those directly involved in certain aspects of national security are needed at work," Thomas said. The National Parks Service said each park is developing its own shutdown plan. Services that require staff, such as campgrounds and full-service restrooms, won't be operating, spokesman Jeffrey Olson said. Airports will remain open. TSA workers who screen passengers and the U.S. Customs and Border Protection are considered essential federal employees. In the aftermath of Hurricane Irma, parts of Florida remain dependent on the Federal Emergency Management Agency, which continues to process reimbursement requests from cities, counties, police and hospitals. Some are from hurricanes Matthew and Hermine, 15 months ago. Cities and counties across Florida are still awaiting payment for emergency road and bridge repair, police overtime and other costs, and the full financial impact of Hurricane Irma hasn't yet been fully calculated. A FEMA spokesman said that all employees whose salaries are paid for from a federal disaster relief fund — not annual federal appropriations — can keep working. Former FEMA Administrator Craig Fugate, a Florida native, said a shutdown would be "a huge deal," according to the Washington Post. Any lapse in federal appropriations would result in temporary furloughs or unpaid leaves of absence for FEMA workers considered nonessential. "Who do you think processes the payments?" Fugate asked, according to the Post. "Who do you think does all that back-end stuff?" Then there are veterans. Florida is No. 3 in the number of veterans, behind California and Texas — and they are a highly influential voting bloc. Even if the shutdown persists, veterans would still receive their health care benefits. Of nearly 340,000 workers at the Veterans Health Administration, only about 1,000 are subject to furlough. Hospitals and crisis and mental health services would all remain open, the agency said. The reason the VHA is so heavily shielded from a shutdown, according to Jason Dangel, a spokesman for the C.W. Bill Young VA Medical Center at the Bay Pines VA, is that the VHA received 2018 funding from the federal government's 2017 budget. "For the hospitals and clinics and health care operations, those operations would persist through a government shutdown due to advanced appropriations," Dangel said. 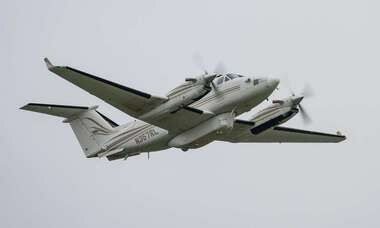 But other Department of Veterans Affairs functions would be impaired, such as non-medical benefits offered by the Veterans Benefits Administration and burial services through the National Cemetery Administration. Roughly a third of the VBA's approximately 23,000 workers are subject to furlough, while one-fourth of the NCA's 2,000 workers would face furloughs. In addition to the potential impact on everyday Floridians, a shutdown has perilous political implications. Gov. Rick Scott is an ally of President Donald J. Trump, but the governor spared no one of responsibility Friday. 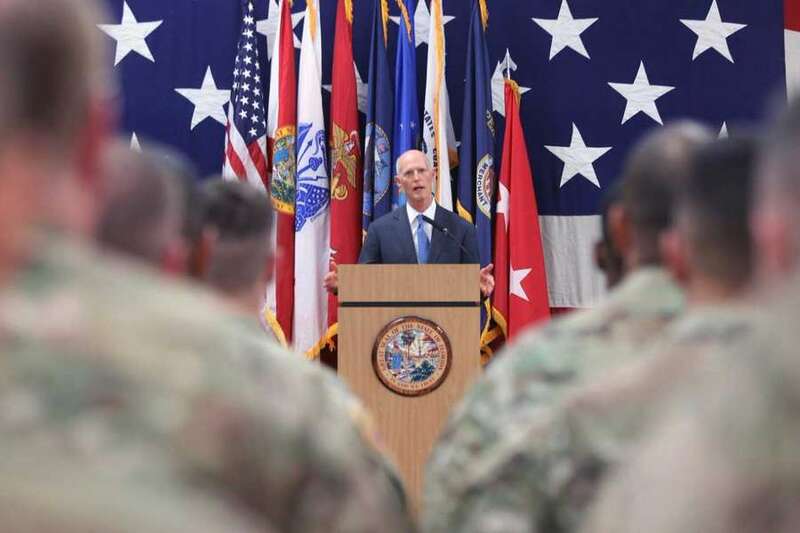 After a deployment ceremony of the 260th Military Intelligence Battalion in Miami's Allapattah community, Scott criticized everyone — from Trump on down. "Do their job," Scott told reporters outside the Robert A. Ballard National Guard Armory. "We shouldn't be seeing government shutdowns. It's not fair to the citizens of our state. We all pay our taxes. We expect the individuals who go to D.C. to represent us to do their job." "It just shows the incompetence of Washington," said Scott, who's widely considered to be plotting his own campaign for U.S. Senate. Scott's office declined to say what kind of contingency plans it has ready to implement in a shutdown. The last federal government shutdown, in early October 2013, had serious effects on routine government services. In Florida, Head Start programs were suspended, National Guard employees endured furloughs, disabled veterans had trouble filing claims and federal shipments to food banks to feed nearly a million residents in South Florida were suddenly interrupted. As President Barack Obama and House Speaker John Boehner traded insults in Washington, charter guides were banned from taking clients fishing in Florida Bay, sealing off more than a thousand square miles of prime fishing between the southern tip of the mainland to the Keys. One issue holding up a compromise on a short-term spending bill to keep the government going is the fate of the so-called DREAMers, an estimated 800,000 undocumented immigrants who came to the U.S. as children and face deportation if the program is not extended in March. Scott this week wrote a column in USA Today in which he called for protections for them. "We have to secure our borders," Scott said Friday in Miami, "and we have to take care of the individuals who came here as children through no fault of their own." Democrats accused Scott of another flip-flop, noting that he once favored a hard-line immigration law, and that he agrees with Trump on tougher border protections. "The governor cannot hide from his record. He can't pick and choose when to demonize immigrants and when to pretend to be their savior," said U.S. Rep. Ted Deutch, D-Boca Raton. Times staff writers Josh Solomon and Howard Altman and Miami Herald staff writers Chabeli Herrera and Jenny Staletovich contributed to this report.